Homemade coffee liqueur is a great gift for the holidays, and makes for pretty tasty cocktails. We’ve spiced ours up a bit with cinnamon and clove for extra festive flavor! Like any good thing, it does take time (3 weeks for this recipe), so get started now to be ready in time for gift giving season. Pour Vodka, coffee liqueur over ice and top with half & half. In a large jar: Combine vodka, coffee beans, vanilla, cinnamon and cloves. Allow to infuse for one week, shaking occasionally. Strain the mixture through a sieve into a clean jar. Don’t let the coffee beans and spices go to waste, let them dry and use for decoration in little jars or bowls. Add the sugar and water to a saucepan and stir over high heat until sugar is dissolved. When cool, add to the jar with the strained vodka. Seal the lid tightly and store in a cool dark place for at least 2 weeks before drinking. This allows the sugar and water to blend with the vodka and spices. Homemade mulled apple cider is a Thanksgiving staple, only made better by the addition of whiskey, and a certain way to wow your friends and family. Our recipe is simple, classic, and tastes just as great as it smells! Bring apple juice with spices to a boil, reduce heat and simmer 20-30 minutes. Serve hot, add whiskey to taste. Shorter darker days and snowy nights call for warming spiced cocktails. The winter sour is a perfect warmer after a day out skiing or skating, or for holiday get togethers. Shake all ingredients without ice for 30 seconds, then shake with ice. Strain into a rocks glass and garnish with a couple drops of Angostura bitters. Bring all ingredients to a boil, reduce heat and simmer for 5 minutes. When cool, transfer all to a clean bottle. Refrigerate for up to 30 days. Toddies aren’t just for whiskey. If you’ve never tried a gin toddy, now is the time! This herbal gin wonder breaks the typical toddy mold in the most delightful of ways. 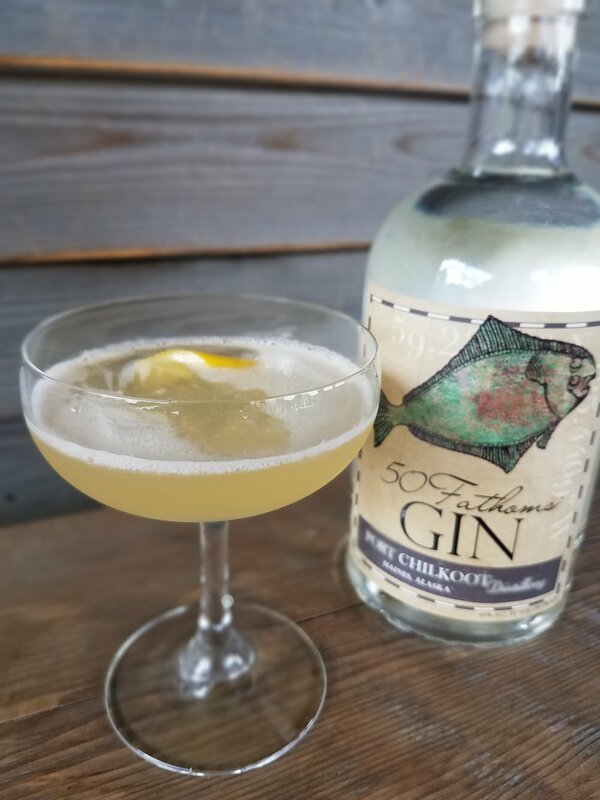 Honey+Thyme syrup gives a little extra much needed warmth that feels just right for fall and winter, and the botanicals in our 50 Fathoms Gin are just as tasty warm as they are in an icy martini. Combine ingredients in the mug of your choice, top with hot water. Garnish with a lemon wedge and a sprig of thyme. Bring to a boil and simmer for 2 or 3 minutes. Let cool and strain into a bottle. The Gin Fizz: delightfully decadent, and a beautiful way to start a weekend. The addition of egg whites are what make this classic so fluffy and lovely, don't leave them out! Combine ingredients in a shaker, shake without ice for 15 seconds, then with ice until cold. Strain into a rocks glass and enjoy! Fall is upon us, with shorter days and cooler temps. Bring out your sweaters and your whiskey, fall is also hot toddy season! Add ingredients to a mug and top with hot water. Garnish with a lemon wedge and enjoy! Mix equal parts water and honey in a saucepan and heat until blended. Cool and bottle, store in the refrigerator for up to a month. In the late 1800's the Sazerac cocktail was created in New Orleans, using Brandy and Peychaud's bitters. 25 years later, the drink was altered to the drink we now recognize as a classic; rye whiskey, absinthe, and bitters. 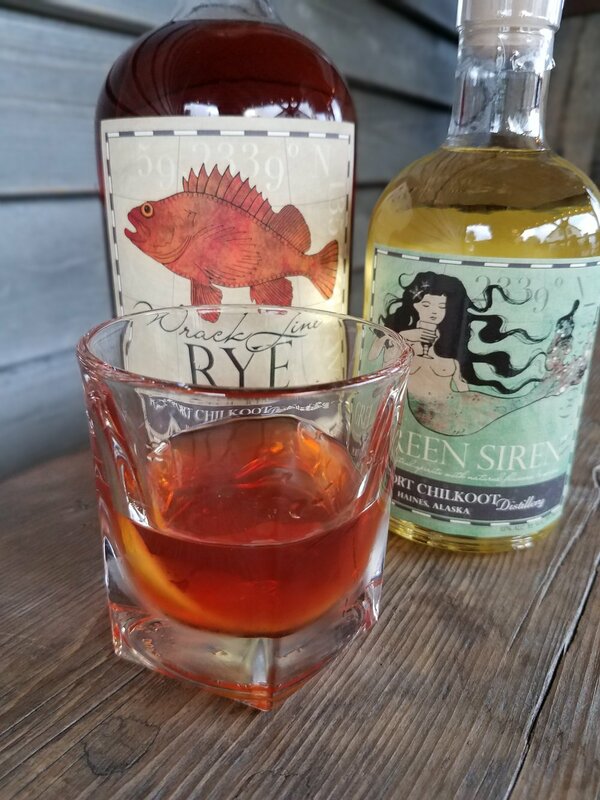 We've brought a taste of the French Quarter to Haines by using our Wrackline Rye and Green Siren Absinthe to create one very tasty Sazerac in the tasting room. Strain into the rinsed glass, garnish with a lemon twist. This cocktail dates all the way back to prohibition, when gin came from a guy who knew a guy, and served in top secret speakeasies. Nowadays, the distilling world is a different place. We use high quality ingredients, and our very legal 50 Fathoms Gin is served in bars and restaurants all over the state. You may have even had this exact cocktail in your favorite drinking establishment. Shake and strain into a coupe glass, garnish with a lemon twist. Mix equal parts boiling water and honey in a saucepan or large measuring cup until combined. Cool and bottle. Will keep for up to one month refrigerated. Named after John and Sharon Svenson, this quirky twist on a whiskey sour is a favorite of both locals and new visitors! Shake and strain over ice. Garnish with a lemon twist and enjoy! Bring sugar, water and spruce tips to a boil in a saucepan and turn off. Bottle when cool. Beets. Earthy, rich, lightly sweet, and a gorgeous deep red. In our humble opinion, these tasty root vegetables are more than just a side dish. They're full of potassium, manganese, and pair spectacularly with gin. What more could you want from a cocktail ingredient? A few things you need to know about dealing with beets, if you haven't had the pleasure already. Well, actually, just one. They will turn everything pink. Wear gloves if you want to keep your hands human colored, and an apron if you value your clothing. Give them a good scrub with a vegetable brush, then peel and chop into one inch pieces. We added frozen raspberries to ours, but you can use blueberries or strawberries as well. The berries add just the right amount of sweet to keep the beets from being an overpowering flavor. Combine in a food processor and blend until smooth. Shake ingredients with ice and strain into a chilled coupe glass. Garnish with a lemon twist. As some of you know, the laws that allows distillery tasting rooms in the state of Alaska are in the process of being reinterpreted, and not in our favor. For the full story, go here. The most recent part of the process was a public comment period where people were able to submit letters and thoughts either for or against the proposed changes. The public comment period closed December 29th, and we were overjoyed with the outpouring of support from everyone who took the time to send in a few words on our behalf and on behalf of the other distilleries affected. We go into this next part of the process with a feeling of hope knowing that so many people love what we do and want it to continue. We wouldn't be here without all of you! There will be a meeting of the ABC (Alcoholic Beverage Control) Board in Juneau on Tuesday January 23rd. We will have more information afterwards, and will post updates as soon as possible. Come have a drink or buy a bottle! The tasting room is still serving our regular menu items, open 4pm-8pm Wednesday - Saturday.